We woke up at 9 and with blurry eyes, tossed food in a cooler, threw our still-warm pillows and blankets in the backseat, waved goodbye to the little brothers and took off in a little purple Honda to a place I had dreamed about going to for like, 10 months. We arrived at the West Entrance to Joshua Tree National Park around 1130, bought a day pass, drove to Black Rock Canyon campgrounds and found a place to pitch the tent for the night. We spoke to the nicest ranger, and she told us her favorite camping spot was open - #99. It over looked the desert, and she said it wouldn't be too windy so we'd be warm. After getting lost in the campground (lololol) we found our tiny square of dirt, set up the tent in the bitter wind, and made ham + cheese sandwiches. 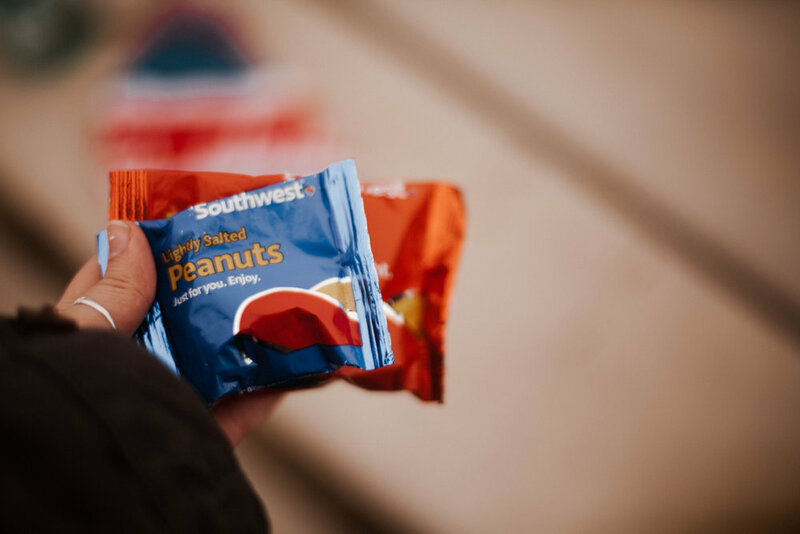 thanks Southwest, for supplying us with snacks. we hiked around the campgrounds and eventually ditched the beaten path to make our own, climbing a foothill. Due to the vast difference of our strides, I was always falling behind (also because I was stopping to take pictures). we stopped after awhile to sit and shed our coats, and gazed over the valley. I honestly don't really remember what we talked about. we were filled with peace. we hopped back in the car and drove around the park, listening to The Head and the Heart's new album, stopping periodically to climb. We thought we found Skull Rock (it was an imposter... we found Skull Rock the next day), we were almost t-boned, and we subtly fought over the temperature of the car. we drove to Key's View for the sunset. this was one of my favorite moments from the whole trip. From there you could could see Coachella Valley, Palm Springs, the San Andreas Fault line, and on clear days you can see Mexico. But the mountains and fog reminded me of a celtic countryside. so, obviously, i was sold. we drove back to the campsite and attempted to get a fire going. but after 20 minutes of frustration because of the howling wind, Josh decided to drive to town to get lighter fluid. literally 3 minutes after he left, I was eating salt + vinegar chips, and I look over at the firepit and there's one flame peeking from underneath the wood. I helped it along, and two minutes later it was a blazing fire. I chuckled to myself as I tried to text Josh to tell him to forget the lighter fluid, but my phone had no service. I gave up, went back to my chips, and tried to get warm. I anxiously waited for Josh to get back, for a few reasons. 1) every time a bigger piece of ember floated off in the wind, the words "fire danger - VERY HIGH" flashed before my eyes and I was terrified I was going to set the whole stupid desert on fire. 2) I hoped Josh wouldn't be mad I had the gift of fire and he didn't. heh. He returned and laughed at my anxiety, grateful that we wouldn't freeze to death but also annoyed it cost him $10. we made more sandwiches and crouched on the sand in the dark, our only light being the campfire. we sat there for hours, having some of the best conversations we've ever had. but dang. it. was. cold. I'm sure the rangerwoman didn't lie when she said the wind wouldn't be bad, but for us, it was still bad. after a night of cold I'll never forget, I was grateful to feel my nose again in the morning. the air wasn't the problem, it was the wind, and although the tent prevented that from thundering against our bodies, it was so, so loud. We had wrapped ourselves into burritos with every blanket and article of clothing we possessed, huddled in our own corners of the tent, and from the moment we zipped the tent shut to the moment we crawled out, we couldn't move for fear of letting in one sneaky gust of wind. we ate some yogurt, packed up camp, dreamed of hot coffee, and continued exploring the park before heading home. we tried to take a self-portrait with the camera on a timer, set on a rock, but we had a few malfunctions... including me almost tumbling backwards down a ravine because i misjudged how difficult it would be to scramble from where i set the camera to where Josh was standing. so here's the result - we didn't retake it. we arrived home around 3, found the brothers where we left them (watching Spongebob in their pj's), made hot coffee, took a hot shower, and slept for a solid two hours. we woke up to Mama Aaker's beef stroganoff and I enjoyed my last night in California snuggled up on the couch in front of a fire we didn't need to protect from the wind. Joshua Tree... we'll be back.